The gallery is pleased to present its third exhibition of egg tempera paintings and works on paper by Sarah McEneaney. The exhibition will comprise works completed during and in the months following the artist’s two month Chinati Foundation residency in Marfa, Texas earlier in the year. In keeping with her work produced during the last decade, the artist’s subject matter is drawn from her everyday experiences. Whether an event is large or small, public or intimate, McEneaney allows the viewer into her world, meticulously and keenly observed. This body of work explores the spaces occupied and observed by McEneaney during her stay in West Texas. Her subject matter includes interiors of her Marfa studio with works in progress on the walls as well as images of the flat and arid landscape accented by low brick walls surrounding her studio. In keeping with her earlier work, the artist also includes several self-portraits, standing by a field with Pronghorned Antelope grazing in the field, in her studio working, or in bed at night. In her outdoor paintings, her palette has responded to the local color, shifting from her usual vivid colors to the bleached and blond light of West Texas. McEneaney received a certificate from the Pennsylvania Academy of the Fine Arts and studied at Philadelphia College of the Arts. 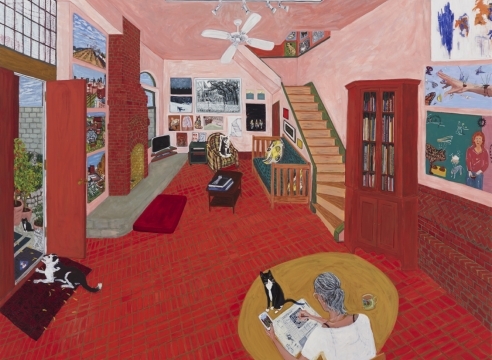 Her work has been the subject of numerous museum exhibitions including the Delaware Art Museum, Moore College of Art and Design, and a retrospective at The Institute of Contemporary Art in Philadelphia. She has had numerous exhibitions both in New York and Philadelphia, where she has lived and worked for many years. She was recently awarded a Purchase Prize from the Academy of Arts and Letters in New York. Her self-portraits were included in a small show of artists inspired by Frida Kahlo that accompanied the traveling exhibition of Kahlo’s work.